At First Sight: Lucas Dempsey never intended to stay in Anchor Island once he graduated high school, in fact, he doesn't even like to go back there with any frequency, and certainly not now when, during his last visit, he lost his fiancée Beth to his older brother Joe. But when his father suffers a heart attack, Lucas is forced back to the Island and gets roped into day-duty tending the family's bar & restaurant; along with Sid Navarro, a long-time family friend and all around awesome boat mechanic. Sid has been in love with Lucas since they were children but, even though they were the same age, she was always more Joe's friend than his, but now that they are working together, he can't help but notice her. Sid can swear like a sailor and dresses like a 14 year old boy, but under all that there is a body he can't ignore, and a quick witted mind that makes him laugh. Sid doesn't want to get involved with Lucas, not when she knows that he's only in town temporarily and that he'll go back to his life as a lawyer soon enough; but before long, the attraction between them is too much to resist. Second Glance: First off, I loved visiting Anchor Island again, I really enjoyed Meant To Be (Joe and Beth's story) and I was happy to see them and Anchor again. And, over all, I quite liked Up to The Challenge, I seriously loved Sid in the previous book, she was a lot of fun and I wondered about Lucas who was sort of in the background during much of Meant to Be. Seeing things from his perspective helped me understand him better, though I do admit I liked Joe a little better. That's probably my one trouble with the book: I liked it, but I liked the previous one better, and a lot of it was because I didn't like Lucas as much. I understand him but I just wasn't as involved. 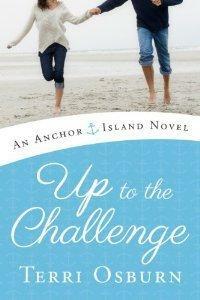 Bottom Line: I definitely recommend Up to the Challenge and it's predecessor, they are both smart and funny contemporaries, with a lovely setting I'm happy to visit again and again.